thats tempting, however i think for duplicability id like to use "off the shelf" items that are easily available to everyone.. but im sure people could modify a they see fit.. It is a common scooter and engine, much more so than the lifan, but I guess you can't get honda crate 50cc motors? not thinking a product , more a open source plans for alternative transportation..
how about a simplified mini version of the aptera.. I have been doing some research on how to put a tadpole trike together with a motored bicycle engine, and then add a coroplast fairing. This could legally be a moped in MI. Here is a good thread: My next project - Tadpole Trike - Motorized Bicycle Forum - MotoredBikes.com: The LARGEST Bike Engine Forum on the net! I think I could put one together for about $3k. I am kind of up in the air over electric or ICE, but either one could work, it just depends on if you plan to use the vehicle and stop every 50 miles to charge or if you want to do long distance travelling. I think the Staton, Golden Eagle Bicycle Engine or Dax Titan four cycle gas motor kits would all work good, providing at least mid 30's mph and around 200mpg, possibly better with a fairing and hypermiling. If you need faster than that, then you would need to register as a motorcycle and might as well go with something like a Lifan 70 with a three speed transmission, that will give you about 45 mph if geared right. I am not sure how well this vehicle would fit in with today's traffic, it is wide and will take up a lane, but cannot keep up with traffic on uphills. One hint on how to acquire a tadpole trike, go to crazedlist.org and get their search function working and do searches for "tadpole" throughout your region. There are numerous tadpoles out there for $1000 or less. A 26" rear wheel will be easiest to add a bicycle motor kit to but other sizes can be worked out as well. All you need to care about is weight, stability, and visibility. If you want to plod around at 30mph, I'd put a lot of effort into making the car visible. 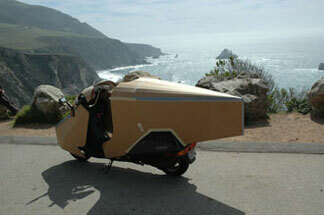 Aerodynamics mean little anywhere a 50cc can be legitimately used. The cheapest, easiest way to go is a scooter fairing. The engineering is done for you. the lifan motors are exact knockoffs of the Honda's .. closest thing you can get to a Honda crate motor..
one consideration is larger diamiter the tire the smother the ride and less rolling resistance.. i found some 26" rims for carts that would work well and provide very economical tire replacements.. AKA mountain bike tires..